Form does not allow you to type your name in the name field. 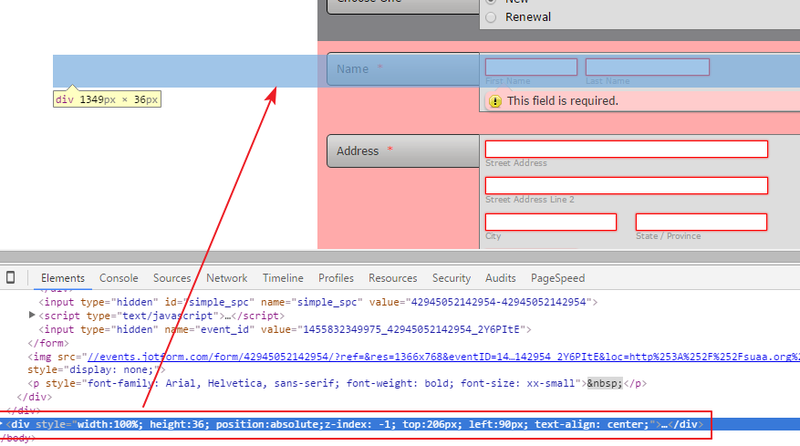 I'm checking your website, I see you have embedded the form's full source code in it. It also does not seem to work the same way your direct form URL does. Here's you direct form URL: https://form.jotformpro.com/42945052142954. If you are making changes on the form using the form builder, it won't reflect on your website because you are using the raw source code. In your live form using the direct link, you can type on the full name field, I presume the problem is related to the code you have embedded on your website. Please try getting a fresh copy of your embed code under the "Publish" wizard, if you are not injecting custom scripts inside the full source code, I recommend using our iFrame embed code instead. Oh, sorry, I started working on the form at Jotform formbuilder before you looked at it, that is why the direct form is different. Check out the name field, though. You can't type in it. Here is another one that doesn't work. You cannot select the "Currently Working" radio button. You can successfully select "Retired" or "Will Retire in the next two months or sooner, but not "Currently Working"
I see that there is a div element on your webpage which is blocking the input fields particularly at that area. I'm not sure if this is referring to something else on your web page. You may either remove this div section or change the z-index of this element to -1 in order to bring the text box in front of the div. This is the same case for the other web page you are mentioning here. Hope this information helps!